Home > Ask Our Experts > Can I Change My Daughter's Surname? My daughter has my surname as her biological father and I weren't married and split when I was a few weeks pregnant. I'm now having my second child and my partner and I are getting married soon. Can I change my daughter's surname to that of my partner? A person with parental responsibility for a child can change the child’s name without any special procedure simply by calling the child by the new name. It is not necessary to change the name by Deed Poll. As the child’s mother, you automatically have Parental Responsibility. However, anyone else with parental responsibility will also have to agree to the Change Of Name. Whether or not you would need the consent of your daughter’s biological father will depend on certain factors. In some cases, a father without parental responsibility could get a court order overturning a change of name if the court decides that the name change is not in the child’s best interest. If objections are raised to the proposed change of name, you could apply for a court order approving the new name. For a child under 16 years of age, the name can be changed without the child’s permission. However, a child who objects to a change of name could apply for a court order reversing the change. The court would take into account the child’s maturity and understanding of the situation, and any adverse impact it thinks the change could have on the child’s wellbeing. For everyday life it is sufficient simply to tell people that you wish the child to be known by a new name. However, for some official functions – such as applying for a passport – something more official may be required. An alternative to changing the name by Deed Poll is to get a statutory declaration. A statutory declaration is a formal document, on which your signature must be witnessed by a solicitor, which could be used to state officially that the child’s name has been changed. A name entered on a birth certificate cannot be changed on the original certificate unless it was spelled incorrectly. 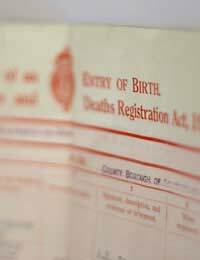 To record a change of name the birth must be re-registered. However, a birth can only be re-registered to show the name of the biological father or of the child’s adoptive parents. As a 77year old my only wish is for me to have included with my surname is of the surname of my stepdad...my stepdad surname being in the middle. What is the procedure for this,any advice would be much appreciated. Hello, my daughter has got my surname. Her father is on the birth certificate ,and we are not married yet. How do l changeher surname to have it sale as herfather? Do l need to re register the birth? Thank you!! I'm wanting to change my daughter's surname from their biological fathers name to mine. They are 9 years of age and havent had contact with him from the ages of 1/2 years due to him being abusive towards me which lead to him going to prison on 2 separate occasions and also resulting in me having a restraining order on him which lasted 7 years. He is on the birth certificate but I do not want to contact him for obvious reasons. I'm really stuck with where to go on this. Thanks in advance for any advice given. My daughter and son who are 14 and 12 don't see their biological father and especially my daughter wants to be known by her step dads surname and my son has also said when we get married he wants to change his surname. It says in previous parts that a mother can change the name without fathers consent if the birthday was registered before December 2003 which my daughter was born in October 2003 so can I change it for her without her father knowing and how would I go about this please. Could I re register her birth with her stepdads name on it or am I getting confused? Hi, I have a daughter who is 3 and hasn’t seen her biological father since she was 8 months old. He has no contact with her, doesn’t pay maintenance and he’s recently changed his surname. Can I change my daughters to my surname? My daughter is 15 on her birth certificate is her father's surname. As we have not seen or heard from him since she was 2yrs old she chose to be known by my surname and is done by all her schooling etc She want to officially change it as she will be applying for her learners permit bank account etc. We have no $$$ and was wondering how we go about it. The name can be changed with the father's consent. If consent is given, the cost is £36. If consent is not given, you can apply for a court order - the cost of which is £215. Once you daughter is 16 she can change her name by deed poll anyway, so might make sense to wait until then? Hi, I have a 5 year old daughter who has never seen her biological dad. He pays maintenance through his wages being arrested as he’s not willing to pay on his own. Her biological dad wanted nothing to do with her and is not on her birth certificate. I have met a new man who treats my daughter as his own and my daughter loves him as a Dad, we are having a baby together and I wondered would it be possible to change my daughters surname to my partners surname so both my kids have the same surname without the consent of her biological father? It’s my surname she has. Thanks for your time. You will need the consent of the biological father. If the father refuses consent, you could apply for a court order but the courts will look at all the circumstances and decide based on the best interests of the child. My daughter is 15 on her birth certificate is her father's surname. As we have not seen or heard from him since she was 2yrs old she chose to be known by my surname and is done byall her schooling etc She want to officially change it as she will be applying for her learners permit bank account etc. We have no $$$ and was wondering how we go about it. Hello.me and my future wife decided that after the wedding we will both have hers and mine surname.I have a daughter from a previous marriage that has my surname.if I will add my new wife surname to mine do I have to do the same with my daughter?thank you. No, your daughter has no connection biologically with your new wife, so there's no reason to do this unless your daughter lives with you and you want her to have the same full name. Hello..me and my future wife decided that after the wedding we will both have hers and mine surname.I have a daughter from a previous marriage that has my surname.if I will add my new wife surname to mine do I have to do the same with my daughter?thank you . You will need to apply for a court order if the natural father will not consent. The court form you need is C100. I remarried last year my new partner and have two sons from a previous marriage. I have joint PR with my ex husband with the boys and he pays maintenance and sees them here and there when it suits - basically I provide access 50% of the yearly weekends and extra dates here and there when requested - sadly his parents utilise his access more than him but it’s important I feel they maintain a relationship with them so left the weekends in place ( the boys enjoy it) My youngest ( age 9)wants to change his surname to his step dads but I’m not sure that his biological family are going to approve. how do I stand ? I remarried last year my new partner and have two sons from a previous marriage. I have joint PR with my ex husband with the boys and he pays maintenance and sees them here and there when it suits - basically I provide access 50% of the yearly weekends and extra dates here and there when requested - sadly his parents utilise his access more than him but it’s important I feel they maintain a relationship with them so left the weekends in place ( the boys enjoy it) My youngest ( age 9)wants to change his surname to his step dads but I’m not sure that his biological family are going to approve .... how do I stand ? Hi, my daughter is 6 years old and I always had a lot of problems with her dad, now he has agreed and said he wants to remove his surname from my daughter's name and "stop being her dad" (his words to her) ?? as I change CSA as collet. Can I remove his surname? What can I Do? He keeps emotionally blackmailing us putting my baby girl and me in so much stress as am pregnant with his second child :/. Hi my daughter has just turned two,her biological father wants nothing to do with her because l was just a bit of fun according to him, he pays maintenance and thats it, hes not down on her birth certificate because l didn't think he was her father do l have to change her surname to his or can l leave it the way it is? No, if you entered her name on the birth certificate and it's been that way for two years, you do not have to change the surname. I'm 15 years old and 6months. My biological dad and mom broke up 5/6 years ago,my dad was rarely there when I was younger he was always out drinking and with other women, he has always favouritised my older brother who is currently 18. I also found out as a baby before I we born he wanted to have me aborted for a number of weeks before my mom turned round an said with or without him she would have me! 12 months ago we had an argument, his girlfriend who also treated me unequally compared to my brother and purposely pushed me out was also present, he stood shouting, swearing and even raised his hand to me in temper but did not actually hit me. This broke out into more shouting and swearing and in fear I called my mom and my great nan picked up straight away, ever since then I have gone no where near him or any of them and had no contact. After not having any contact with him for 12 months I have decided I want to change my last name to my mum and step dads last name. Is this possible with only my moms permission?? My daughter has not seen or had any communicationwith her father (his choice) since July 2014.Do I need his consent to change her name as he won't communicate at all and does he still have parental rights considering he turned his back on her? Doesn't want to see her or communicate with her. I would like to change the surname of my son.We have been together long time but now split up.He has been on the birth certificate however I would like to change his surname and move on.What is the procedure?